It's the official road trip driver and MBIP pal, Scott Turley! And check out the shades to ward off any "half-baked" jokes this time. Smart thinking! After a quick beer, we're on the road and Bloomington bound with Scott behind the wheel. It's a cloudy overcast day outside and this is my favorite kind of day. 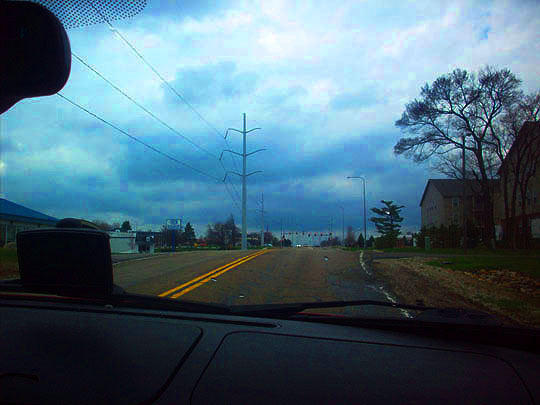 The sunshine is okay, but it's usually too bright for me, so I'm happy to have this cloud cover. And through the magic of the interwebs you're spared a 40 minute ride to Bloomington, which really didn't seem too long and here we are at Lucca Grill on Market Street. Let's go in and start this week's pizza episode! Wow, it's like walking back in time coming in here. 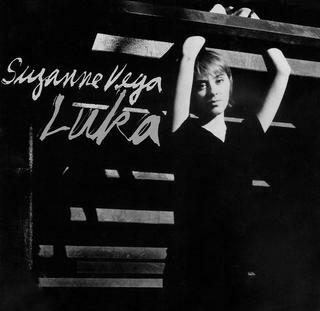 It's really got a cool old-school vibe to it. Elizabeth is the pretty bartender on duty and she's quick with an ice-cold bottle of Budweiser. She told me she's worked here for 11 years, which surprised me because she doesn't look old enough to be bartending. She must have access to the river of youth! Here's a shot of the beers on tap. They have a decent selection, maybe we'll get a rating on the old Spike-O-Meter this week. Elizabeth told me that this is the original tin ceiling that's been here since the place opened in 1936. A Budweiser Clydesdale trolley hangs from the tin ceiling, always the mark of a classic bar when you see one of these. 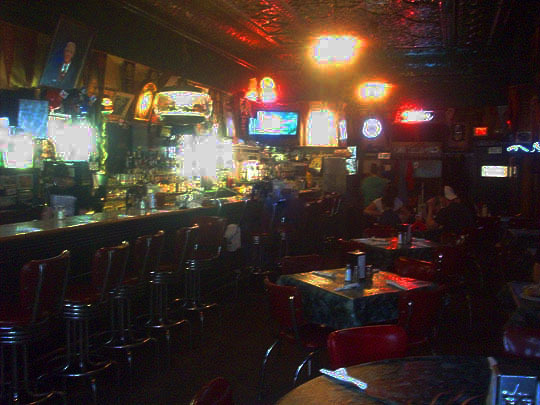 The walls are plastered with sports pennants, beer signs, pictures and memorabilia. Here's an a front page article in the Bloomington Pantagraph about the 50th anniversary in 1986. 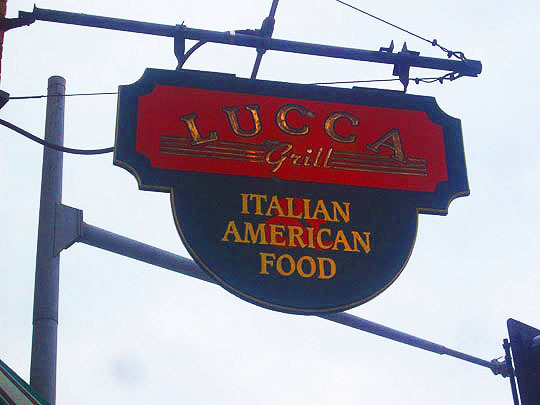 And here's a NY Times article that mentions Lucca Grill. I'm wondering if they have a full-time press agent on staff! 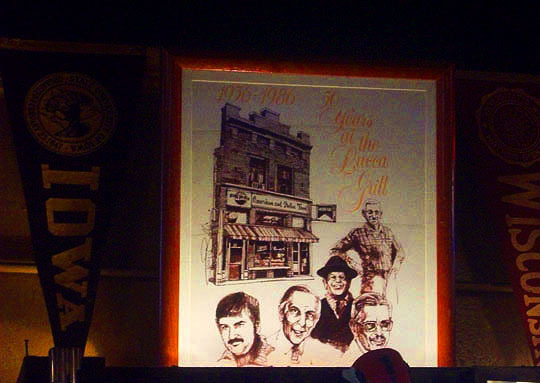 A piece of art made specifically for their 50th anniversary back in 1986 hangs on the wall and depicts the different generations of owners. How cool is this, "Schlitz On Tap" stained glass sign? Equally cool is this statue of a golden woman balancing a Schlitz globe. This is what I call a real golden globe! They have an upstairs dining room, let's go take a look. It's just a little after four in the afternoon, so it's not open yet, but maybe we can take a quick gander and sneak a photo. Here it is, the gander has been taken, now let's get back to the bar before we get into trouble! I joined Scott back at the bar and we ordered our pizzas. The pizzas are made up front in the kitchen near the front window. This is Brennin who's going to be assembling our pies today. She said I was more than welcome to take photos. What a nice, non-Avanti's moment! The fresh toppings are being applied to the pizza in a most skillful manner. Blammo! Into the oven it goes! Meanwhile back at the bar, we're presented with three choices of hot sauce: Tabasco, the ever-present Frank's Red Hot Sauce (which is starting to annoy me) and Scott's favorite, Cholula Hot Sauce. And here's my pizza pie and it looks and smells fantastic! I got mine with extra cheese, ham, bacon, ground beef and onion. Scott got the Barber Shopper Special, which is sausage, mushroom, onion and green pepper with pepperocini served on the side. The pizza lives up to its legendary status. The toppings are tasty, there's not a lot of sauce but it's got a great flavor to it and the crust is thin, but it has a doughy, chewy texture as opposed to a cracker thin crust. After making pizzas for almost 80 years, I guess you learn the craft! I got about halfway through and called it quits. It may be thin crust, but it's very filling. Really great pizza at Lucca Grill! And for dessert, a couple more beers, cheers! Just as we were getting ready to go, who walks in but Scott's brother, Jerry and his wife Mary! This wasn't planned and most of you regular MBIP readers know the drill—time to cue up, "It's A Small World After All." Okay, time for the next day cold pizza tasting. Just as delicious a day later! 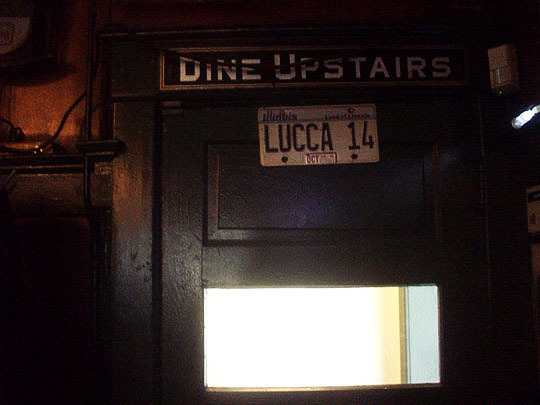 If you've never been to Lucca Grill, I highly recommend it. And remember, I put the "high" back in "highly," so I know what I'm talking about! 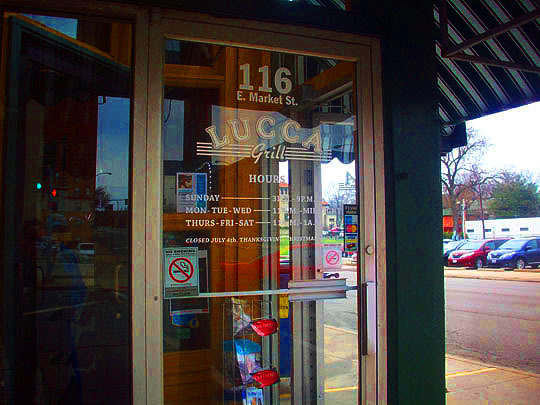 Thanks to MBIP pal and contributor, Scott Turley for driving and to all the folks at Lucca Grill for the friendly hospitality and great pizza! We'll see you all tomorrow! Four Chef Boyardees, wonderful pizza and the place is a real...ahem...slice of history. Oof! Related Posts: The MBIP Year Of Pizza @ Avanti’s, Leonardo’s, Lou’s La Grotto, Knuckles Pizza, Davis Bros. Pizza, Kenny’s Westside Pub, Dave’s Pizza, Peoria Pizza Works, Sugar and Agatucci’s. Yes I think you've seen me before.